Nice collection! The red paint star on the last row is a common socialist type, not a rare or early. As for the green one with the hammer and sickle, is it Bulgarian at all? These were made in Bulgaria indeed, right after the war, by one of the royal times workshops for buttons, cockades, etc. 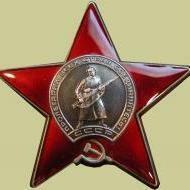 But the production also included same color buttons with star with hammer and sickle and I have heard all these were made for the Soviet forces in Bulgaria, quite a significant army group which stayed in the country for a few years. German made Observer badge - which maker? Thank you Alex! It is marked with a .935, is that the "square punch"? I know it is Bulgarian, but probably this is the place to find out an answer. I believe the badge is German made, so can you tell which maker, by the features of the back side? Marked just with a 935 hallmark. It is silver, the brown stains on some leaves are dirt. Yes, they are. On the right is the Commader of the Air Force, col. Vasil Boidev. Behind him lt.col. Georgi Drenikov from the HQ of the AF, to the left... can't put a name for now, though have seen him on some photos. Is it dated? Probably pre-1940. So, who was the first to use that style of belt and hangers? The Bulgarian ones were influenced from Russia. And not just Russia, the Germans had very similar. Probably some more countries, too? But who was the first? Медал за участие в Европейската война /Medal for participation in the European War/. In the award document it is mentioned as "...the commemorative medal..."
Very nice! And very good photos! This is the back side. The pilot badge is named and dated 1928, but I can say nothing for the observer badge. Just the period can be framed, from a couple of years after the end of WW1, until 1935-36. More likely 20s, being so extraordinary. But who knows! What they flew: right after the WW1, all Bulgarian Air Force aircraft were cut to pieces and the country had no right to have an air force at all. So in the next 15 or so years, it existed more or less secretly. The first aircraft was a WW1 Fokker, hidden in a village to evade being cut. It was fllowed by 2 machines, built from the cut pieces of WW1 planes. In 1924-26 were delivered not large numbers of Potez, Henriot, Cauldrone, Bristoll aircraft, also 2 Macci flying boats. Bulgaria could purchase only from the WW1 winners, only unarmed aircraft and with very limited engine power. In 1925 started the production of Bulgarian aircraft, various models, mostly training. Only in the 2nd half of the 1930's some modern aircraft were delivered and the number increased. In 1937 the Air Force, which existed anyway, was officially restored as a part of the Armed Forces and was given battle flags. Let me show the latest addition to the collection, an interwar Observer badge! The pilot badge is for comparison, it represents the usual construction, hollow silver. The Observer badge is very extraordinary, nearly one of a kind - 3 piece, cutout construction! And original nevertheless. Silver frame and gold plated brass center. The crown has been lost, but I like it anyway! Very difficult to tell. Not only the Bulgarian pilots got the pilot badge, but also a large number of Luftwaffe men. There are 2 types made - the first one is more common, the frame is stamped sheet metal, like on the scan above. The other type is more rare /but IMO not related to more value, just not so often seen/ - with flat back, the frame is thick and not seen as negative from the back, but thick, flat. Same for the Observer badge, two types. The paratrooper badge, based on the number of the trained paratroopers, probably 500 - 600 were made for the Bulgarian paratroopes, plus some more for Germans and other allies. However it is not impossible, that many more were made and never awarded. That's not unheard of with many types of badges and medals.